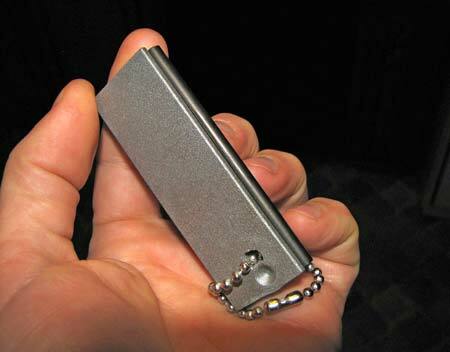 Magnesium fire starters can be purchased at any outdoor store. 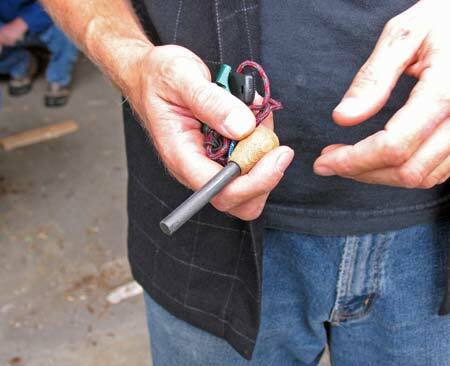 They consist of a small bar of magnesium with a strip of ferrocerium (sparking material) embedded in the one side. 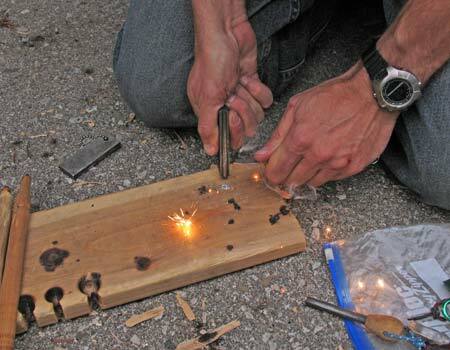 The magnesium burns readily when it is scraped off into fine filings. This photo shows the side with the ferrocerium sidefacing the camera. Here's how to use this device. 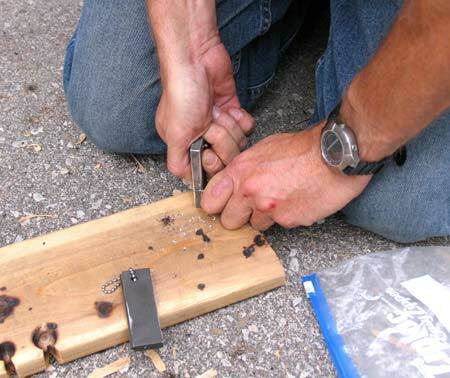 Using the sharp side of a knife blade, scrape some magnesium filings onto a board, or into a tinder bundle. A board is used here for demonstration purposes, so you can see the magnesium filings and what happens with them. Normally if you are intending to start a fire, you would have some tinder and small sticks ready to add to the resultant flame. Gather the filings into a little pile. 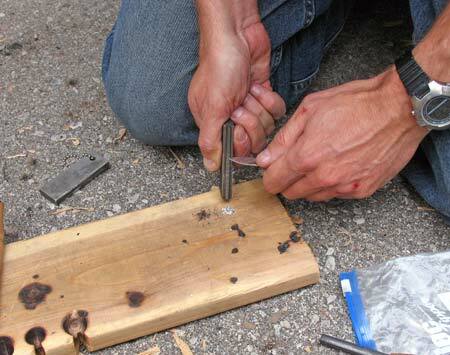 ... scrape some nice sparks off the ferrocerium rod onto the pile of magnesium filings. The spark shown here was deliberately sent a distance away from the pile of filings for demonstration purposes. 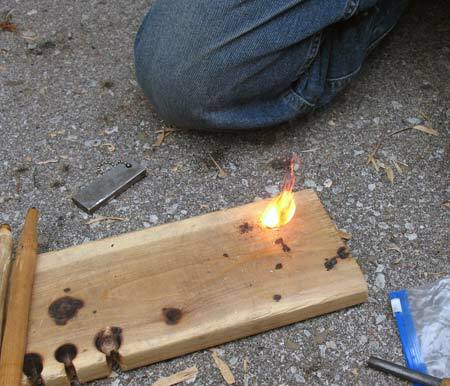 The small pile of magnesium filings ignites quite readily. As soon as the spark hits it it flares into flame. 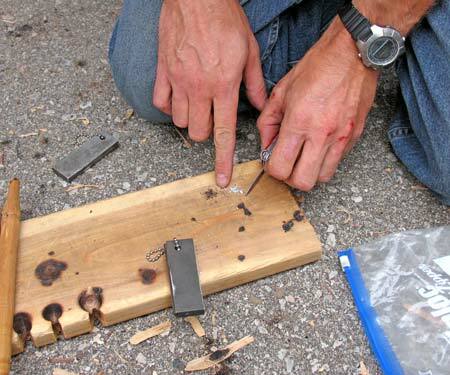 If you were actually trying to start a fire, you would've placed the pile of magnesium filings onto a tinder bundle, which would then readily catch fire and to which could be added small sticks, etc. Or you could lift the flaming tinder bundles and place it into a ready-made teepee of sticks or other ready-to-light fire. Here is another one. This is a very thick rod of ferrocerium. It can be used by itself if you have some really good tinder material to catch the sparks.